In the city, power couldn’t be easier. Just find an outlet, plug in, and you’re ready to go. Off-grid living, however, is a whole different situation. First, you have to figure out a sustainable power supply. Then you need to select appliances and lighting that won’t consume more power than you’re able to generate. While these calculations aren’t tricky, they can seem overwhelming at first. I do get asked sometimes about wind power, but there just isn’t enough wind on a regular basis for this option to be really viable, especially if you plan to spend a lot of time at your cabin. Today, I want to focus on solar. 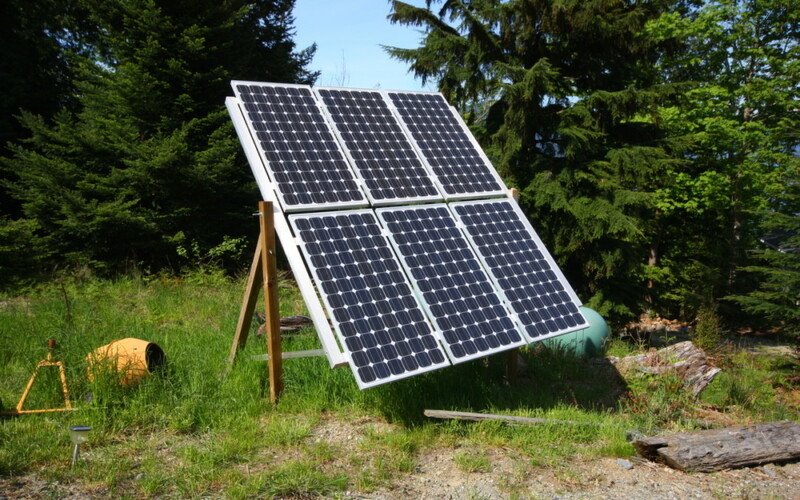 Solar offers a lot of flexibility when planning your cabin’s power system. Systems can range from extremely simple, powering just a few lights and a radio, to extremely complex, capable of generating as much power as a normal home would use in a day. At the same time, solar puts you directly at the mercy of the elements. A solar system needs direct sunlight to generate power — easy enough during summertime, which is, coincidentally, when your power requirements are lowest. But if you plan to spend a significant amount of time at your cabin during the fall, winter, and spring, the amount of sunlight you receive during these months suffers — just when you need to use more power. This is why I recommend a backup generator for anyone who plans to spend serious off-season time at their cabin. At the other end of the spectrum, you could spend $10-20+K on a complex system that would use a dozen panels to generate enough power to run a normal household. And in between these two extremes, there are endless options to either custom design a system to exactly your needs, or to purchase a plug-and-play kit that comes closest to meeting your needs and budget. And as I’ve already mentioned, a generator can be added to the mix to charge up the batteries when the days are short, or if you need to run power tools. If you’re new to the idea of solar power and just starting to do your research, it can be hard to get a sense of what kinds of vendors are out there. There are a number of companies that sell individual components, but these companies and their websites tend to be geared toward techies who already know what they need. I found it really difficult to find a BC-based vendor who sold straightforward all-in-one kits. One company I found, Energy Alternatives, does sell kits geared toward recreational property owners. You may be interested in checking them out first to see what a typical kit contains, then take your research a bit further afield from there. There might be savings to be had for purchasing components separately, so it wouldn’t hurt to look around. Once you solve off grid living you will never want to go back!